Tiberius 4X power scope. 4x32 Illuminated reticle scope with Weaver mount. 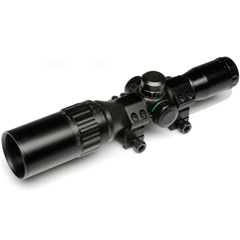 The duplex reticle can be lighted red for day or green for night. Reticle will be black when turned off. Includes flip open lens caps and sun shade.